The first ever Dot Com Pho in Hawaii happened on Sunday at Pho Bistro 2, just outside of Waikiki. We had a total of six people at the Pho meet up, which sounded great until you find out that five of them were me and my family. Thanks to Hugh Kimura of Website Rockstars for attending our first Dot Com Pho Hawaii. Pho Bristro 2 is an unusual Pho restaurant. For one thing, none of the staff speak Vietnamese. Then again, there was only one staff serving the entire place. The manager/server/busboy/greeter at Pho Bistro 2 is one happy guy. He would give the owner of Happy Pho a run for his money. He greeted everyone with a smile and was extremely entertaining with the various antics he pulled while working the room. 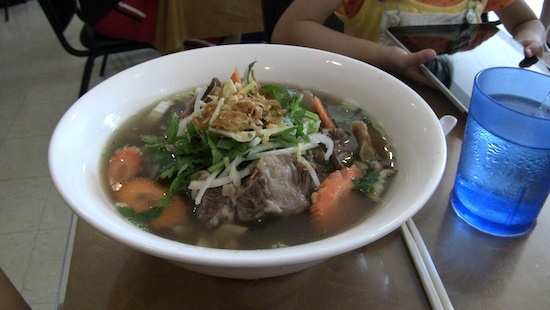 The signature dish at Pho Bistro 2 is the ox tail soup. If you like ox tail, this soup is on the must order list. It made the ox tail soup from Red 8 inedible by comparison. The soup base was very flavorful and the ox tail was extremely tender. 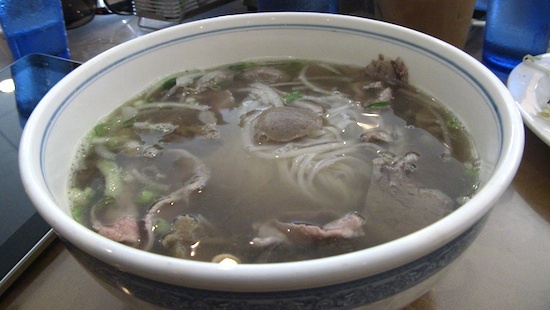 The quality of the Pho matched the high quality set by the ox tail. The Pho soup base had a bit more kick and I found it even more satisfying. The steak comes raw on a separate plate so you can dip it into the hot broth yourself. As far as Pho goes, Pho Bistro 2 ranks among the best I’ve tried. 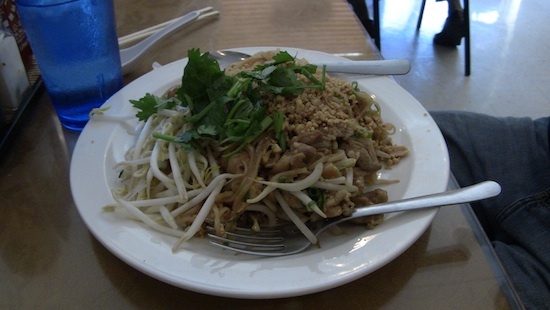 For this episode of Dot Com Pho, we have Sally Chow hanging loose, really slow Internet, two big fans, no AC, the gadget of the week, the iPad game of the week and the happy restaurant server reads my shirt. Enjoy!